The Bon dance is one of the Bon events. The dance is said to have started when people danced in delight along to the Buddhist chants because it rained after doing a ritual for rain. 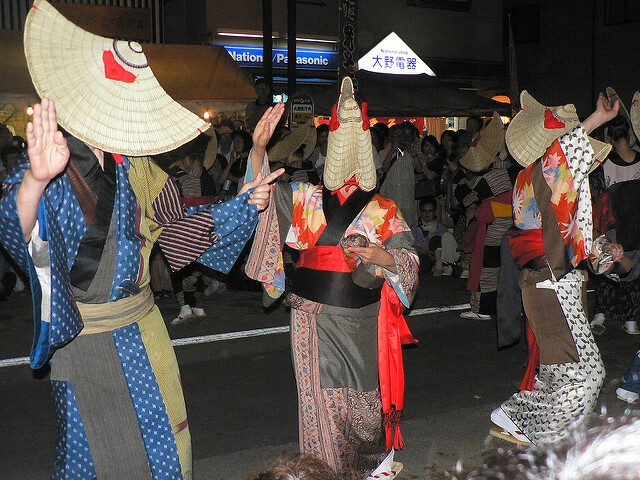 Bon dances were originally held to send off the spirits of our ancestors, but they have become local festivals for entertainment. 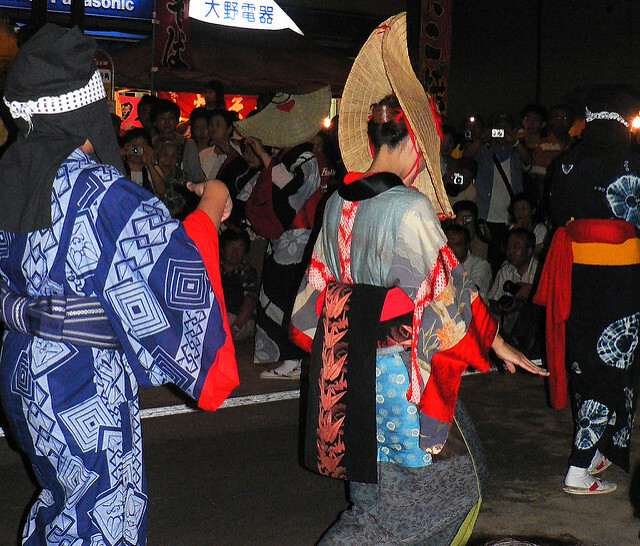 Originally, Bon dance took place from early evening until dawn. People used to gather and dance spontaneously to welcome the spirits of the dead or deities in the early evening and to send off them at dawn. People danced on the border between this world and the netherworld. After send-off ceremony, people never look back, or the spirits come along. 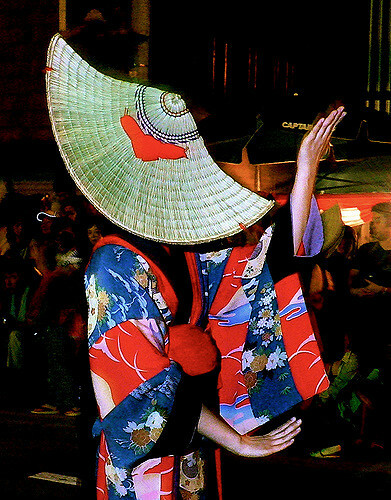 The original form of Bon dance is inherited in some areas. Three main Bon odori(Bon dance) of Japan are Awa Odori(阿波踊り) in Tokushima Prefecture, Gujo Odori(郡上踊り) in Gifu Prefecture, and Nishimonai no Bon Odori(西馬音内の盆踊り) in Akita Prefecture. We've had many typhoons this year. In late July through early August, Typhoon Jongdari exceptionally moved from east to west over Japan, did two loops, and made landfall in Shanghai, China. Typhoon Soulik hit the Amami Islands, moved over the seas west of Kyushu, and made landfall in the Korean Peninsula on Friday before dawn. Typhoon Cimaron moved across the Japanese archipelago and weakened to a tropical storm on Friday. The remnants of typhoons Soulik and Cimaron brought heavy rainfall to Hokkaido. For those who say Tokushima is far away, I tell them Awa-odori is seen in Tokyo and Saitama prefectures. A lot of dancing groups called ren dance at the venues and in the street. In 2017, 169 groups including ones in another areas, dancers from Tokushima participated in the dance festival. About 700,000 visitors came to watch this dance festival. The dance is taking place for 32 nights during a long period from July 14 to Semtember 8 this year. Dance venues are different each time. People dance in the streets from 8 p.m. until the next morning at 5 a.m.(4 a.m. on the last day) from 13 to 16 August. It has been designated an Important Intangible Folk Cultural Property. Dancers have dancing geta(wooden clogs) for Gujo Odori. The event has 10 dance songs. The first song is "kawasaki", and the nine songs including kawasaki are played over and over again. The last song is "Matsusaka." It is played only once a day. 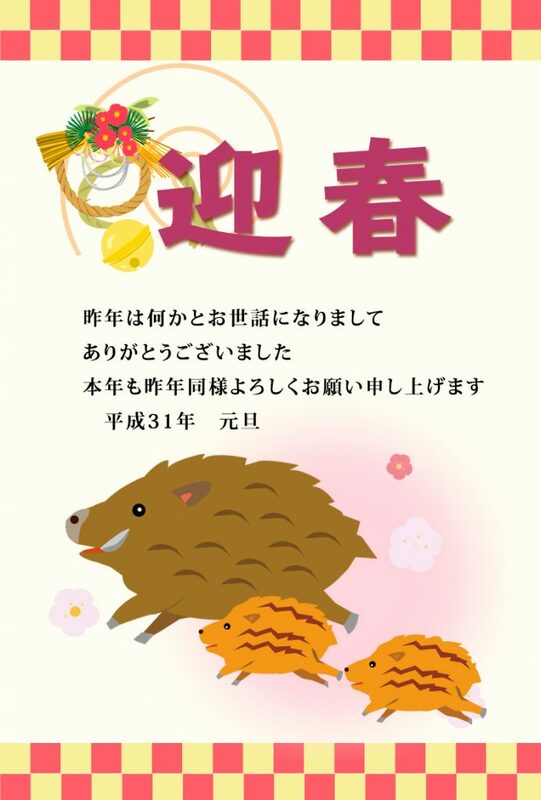 I performed Bon dance to tunes of kawasaki in gym class during high school. According to a historical paper published in 1840, shrine parishioners danced at their shrine until dawn during the Bon period until the middle of the 18th century. The Gujo Domain issued some proclamations that samurai, their family members and their servants were not to be allowed to go dancing during the Bon period. The bon dance has been designated an Important Intangible Folk Cultural Property and takes place from 16 to 18 August every year. What first strikes you about this dance performance are dancers wearing black, fabric full-face hoods with two eye holes. Other dancers also hide their faces with rush braided hats. Dancers wear distinctive, traditional attire. They are patchworked kimono called hanui. 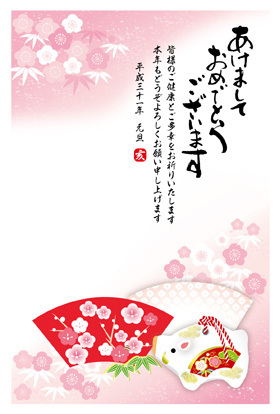 The oldest attire has been passed down from the Edo period. It's not uncommon to see the attire over 100 years old. 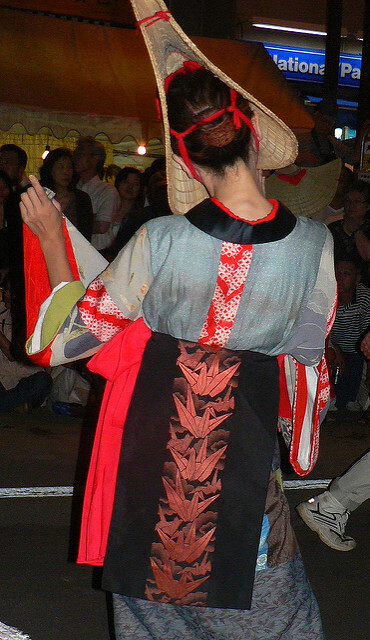 Adult women wear patchworked kimono with rush braided hats. Men and underage women wear tie-dyed kimono with black full-face hoods. There is no records showing the bon dance's derivation and history. 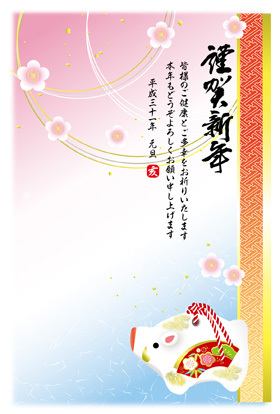 It is said that Nishimonai Bon Odori is a mixture of the dances for harvest and for the dead. According to legend, an ascetic monk built a branch shrine which enshrined Zao Gongen and got people dance to pray for abundant harvests at the shrine in the end of 13th century. A lord of Yashima Castle took refuge in Nishimonai Castle whose lord was his wife's father, but troops tried to attack Nishimonai Castle. The Yashima Castle's lord committed suicide by sword to take responsibility for bringing trouble to his father-in-law in 1593. The Nishimonai Castle's lord set fire to his castle and escaped to Shonai region in 1600. One theory holds that some retainers of the Yashima Castle's lord started Bon dance to pray for the soul of the deceased lord. 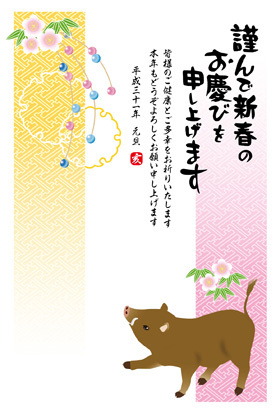 According to another thoery, some ex-retainers of the Nishimonai Castle's lord who remained as farmers in Nishimonai started Bon dance in a reminiscent mood. 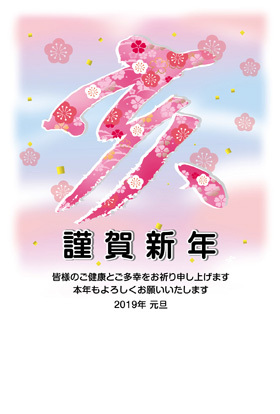 Visitors can see the three main Bon odori in Fujisawa, Kanagawa Prefecture around the end of July. 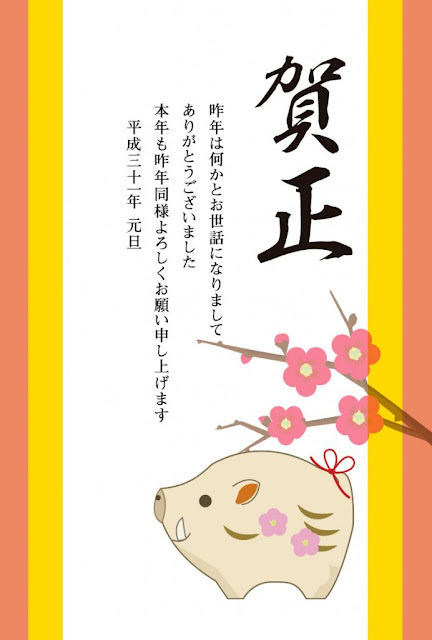 Fujisawashuku Ｙugyounobon is held at shopping malls around Fujisawa Station and Ｙugyou-ji Temple for three days. It is held on 15 and 16 August. Women in yukata(casual summer kimono) dance with Kanatoro(gold and silver paper lanterns) on their heads. Now most Kanatoro are LED paper lanterns. Yamaga Toro(lantern) is made of washi paper and glue. It was designated as national traditional industrial arts in 2013. Kanatoro is popular, but Yamaga Toro has another design that has the shape of various buildings. 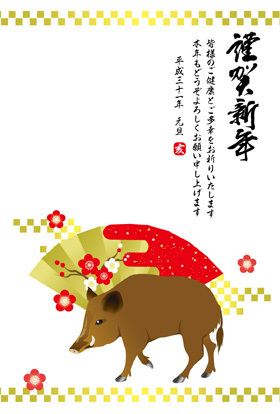 Yamaga Toro dates back to the 12th century when Yamaga residents held up torches to light the way in a dense fog for Emperor Keiko and his party. They got to a temporary lodging for the emperor safely. 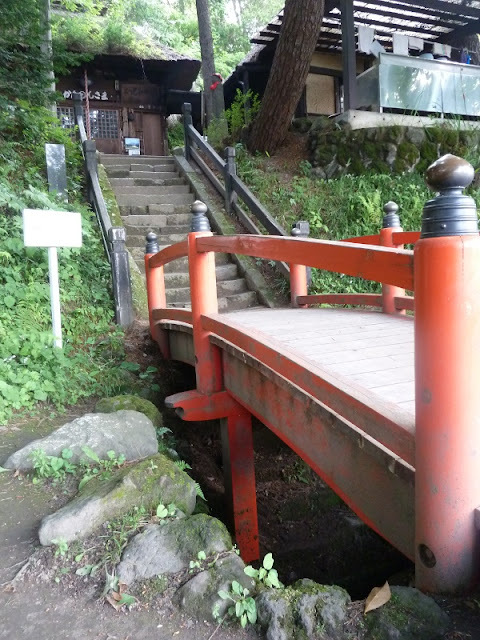 The remains of the lodging(current Omiya Jinja Shrine) was dedicated to the emperor. The residents offered torches to the remains every year. In the Muromachi Period(ca.1336 - ca.1573), torches turned to paper lanterns. It was in 1954 when women with lanterns on their head started to dance. Now 1,000 female dancers with lanterns on their head perform a dance for many tourists. From early evening until dawn, people dance in the streets at Owara Kaze no Bon, a festival to pray for an abundant harvest and protection of planted rice from high wind due to typhoons in Tatsuo City, Toyama Prefecture. The festival continues until dawn even after most tourists go to their accommodation. Kanbara Kannon-do Hall (鎌原観音堂,a temple dedicated to the Buddhist Goddess of Mercy Kannon) stands in Kanbara area, Tsumagoi village, Agatsuma-gun, Gunma Prefecuture. And two female skeletal remains(partially mummified) were found. Mount Asama straddling the border between Gunma and Nagano Prefectures has often erupted. In 1783 the eruption reached its peak about 10:30 a.m. on August 5(the 8th day of the 7th month in the lunar calendar) after the volcano had repeated small eruptions. The eruption issued a large amount of pyroclastic fall, lava flow, pyroclastic flow, debris avalanche and lahar. (mudflow). Experts infer that debris avalanche battered Kanbara village. It crushed 957 homes and left 1,443 people dead in an area surrounding the mount. The two remains were found at foot of the hall's steps. They are considered as parent and child or younger and much older siblings because two restored faces are quite similar. Younger woman was about to give older one a piggyback ride up the steps. They were so close to survival, but just couldn't survive the debris avalanche. There are also other opinions. Some people say that there was no time to evacuate and that people happened to be at the hall to pray for the end of volcanic eruption. Another says that there was 10 minutes to evacuate because the speed of debris avalanche was estimated to be about 30 or 40 kirometers per hour. The survivors were 80 villagers who stayed outside the village and 51 who were able to reach the hall, a neighboring village and a nearby mountain, happened to survive in a hut, a field, a survivor's house. After the disaster 93 Kanbara's survivors remained in the village. Five neighboring village headmen rode to rescue of 93 survivors. In the end 55 survivors have remained in Kanbara ever since. Most survivors in other devastated areas abandoned their villages. The Kanbara's survivors re-established their village in the same place. Widowers got married widows. Parents of deceased children adopted orphans. I have heard a man talking on a TV program before. As I got a strong impression from his talk, it is remembered to this day. A presumed descendant of the survivors said, "A man asked the survivors, 'Why didn't you abandon your village?' They answered, 'Because we couldn't bear to leave our family members behind. They are buried under here.'" 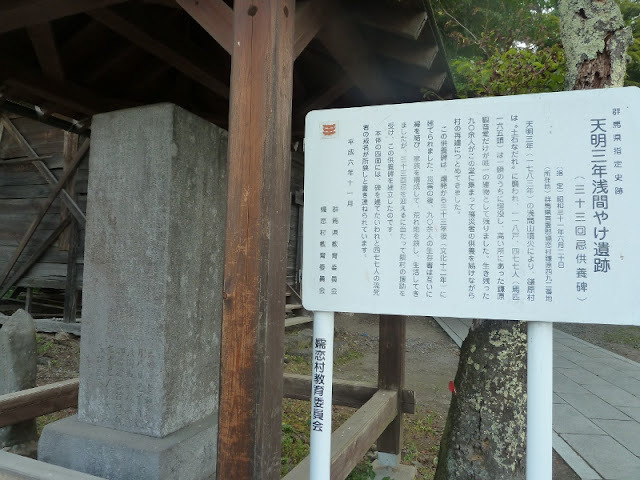 Though it's uncertain as to whether or not he talked about the 1783 Asama Eruption, there is no other instance like the reconstruction of Kanbara village. Kanbara was a pastoral village and yet a strategic spot on the road. Inns, wholesale stores, tea shops lined both sides of the street. The Edo Shogunate disbursed 1,050 ryo(approx. 136 million yen at present value) to Kanbara village and 4,766 ryo(approx. 620 million yen at present value) to 19 seriously damaged villages for post-eruption recovery. Actually, the Shogunate ordered Kumamoto Domain to pay 100,000 Ryo as reconstruction aid. The domain could not afford to pay the huge sums of money, so the domain's residents paid a lot of money. After the Kumamoto earthquakes occurred in 2016, Kanbara residents raised money for victims of the quakes. 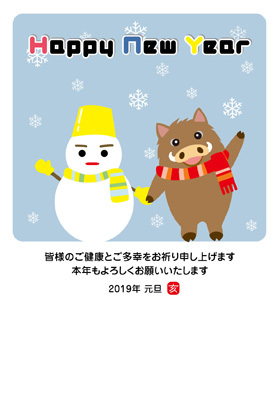 They thank Kumamoto citizens to this day. The surviviors held a Buddhist memorial service on the 32nd death anniversary of the victims in 1815. At the same time they built a monument with carved names of the victims by receiving a helping hand from neighboring villages. Enmei-ji Temple(延命寺) was buried by the eruption. The temple's chief priest was engulfed in the eruption on his way to the Mount Asama on that day. He headed for the volcano to pray to end its eruption. The location and existence of the temple was unknown. Ironically, the stone block was found at the riverside of the Agatsuma River due to flooding of the river in 1910. The remains of its constructions was confirmed buried 6.5 meters under the ground, 200 meters from Kannon-do in 1980. Artifacts including Buddhist ritual objects had been discovered through six examinations since 1985. The remains of folk houses at Tooka-no-kubo(十日ノ窪) were examined in 1979 and 1980. About 2,000 housewares were found. 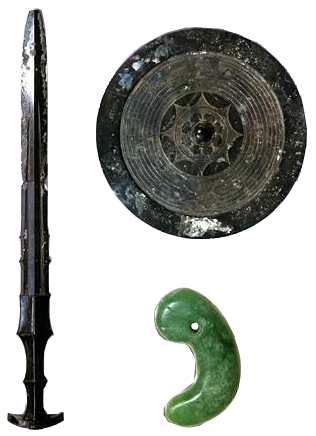 They included some articles such as a lacquer comb, a tortoise shell hairpin, a mercury mirror, a tea bowl and a kettle for the tea ceremony. Their owners were commoners. 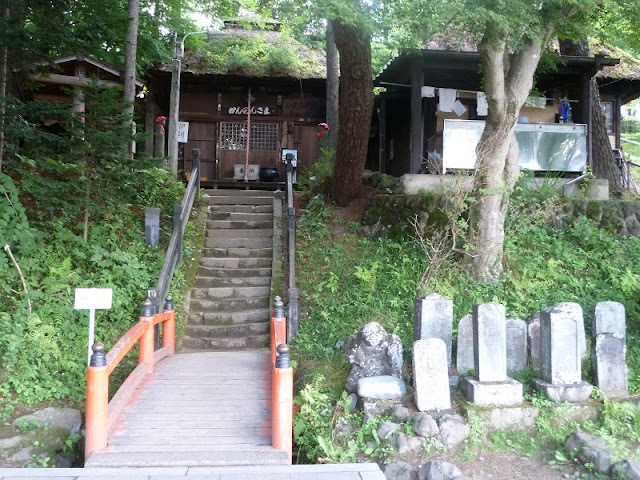 Okomori-do is a building with hanging towels located behind stonegraves. Kannon-do became known to the whole country after examination in 1979. The hall had an increasing number of tourists. 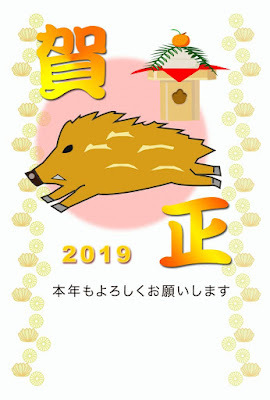 In 1979, 7th and 8th generation descendants of the survivors and their relatives, newcomers after the eruption, launched Kanbara Kannon-do Hoshikai(service club.) They take turns to receive visitors. They offer prayers to the victims, hold memorial service for the victims on August 5 every year. 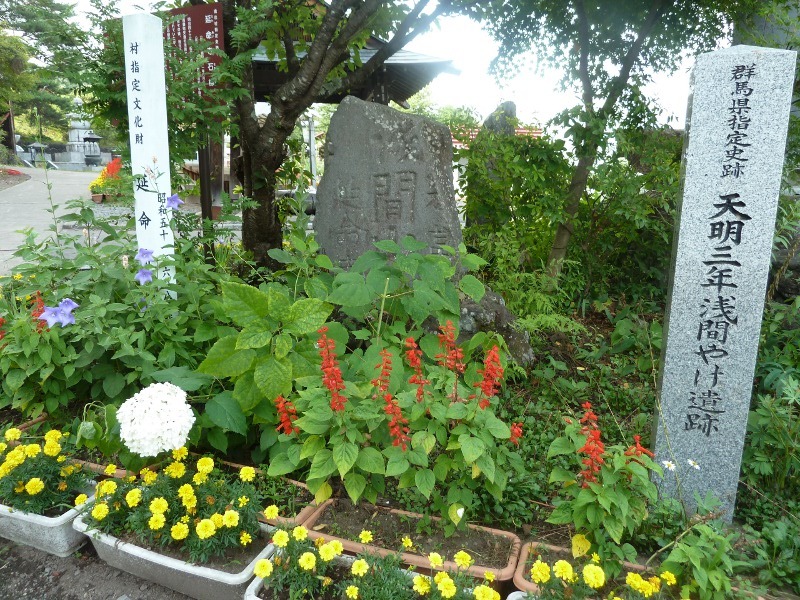 As of 2001, about 80 percent of Kanbara village residents were the descendants of the survivors. So they had a tremendous amount of respect for Kannon(Goddess of Mercy) enshrined in Kannon-do who saved dozens of survivors. Villagers who helped the excavation works had strong sense of prayer. They saw the lifestyles of their ancestors and felt the pains of the victims. Kannon-do is also a meeting place for residents. 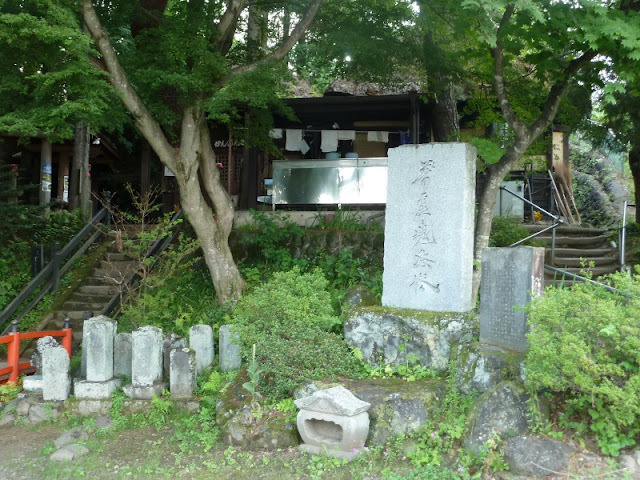 A memorial service called mawari-nenbutsu takes place twice a month. Homes used to take turns providing a venue for it. It is held at a local multipurpose center now. Not all homes participate in it. In the venue, three hanging scrolls with the names of the 477 victims, the Thirteen Buddhas, Kobo-Daishi(Kukai) are displayed. Participants chant some nenbutsu(prayers to Amitabha Buddha) and wasan. 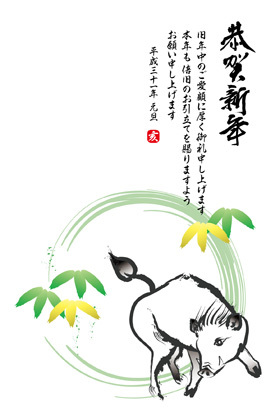 Wasan are Buddhist hymns in Japanese. 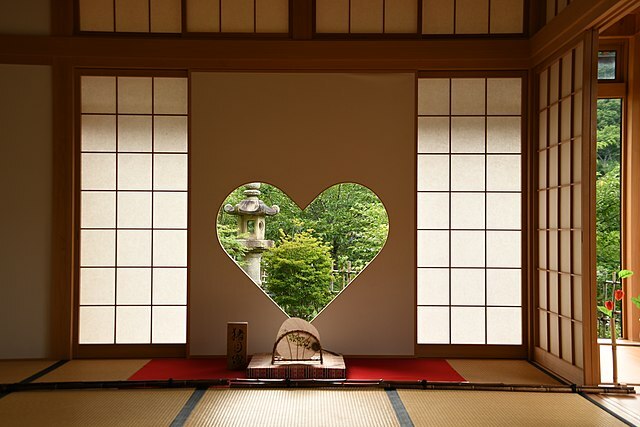 Wasan chanted here were made in the Meiji Period. They represent the tragedy of the 1723 Asama eruption and a prayer to Amitabha Buddha. 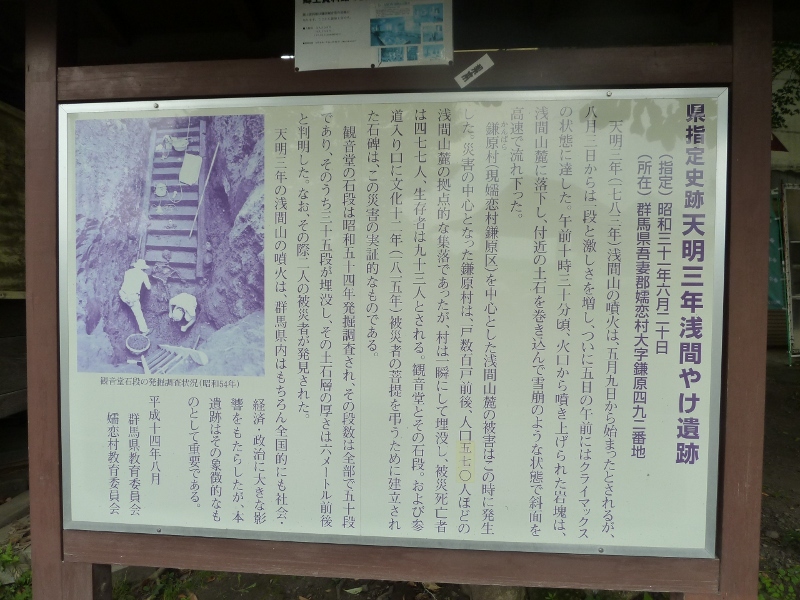 The museum shows artifacts, illustration of damage, an erupting volcano diorama, restored faces of two women who were found at foot of Kannon-do's steps. Visitors can see views of Mount Asama and current Kanbara area in the observation room. Tsumagoi Village is Japan's top producer of cabbages and is a popular tourist destination. Cabbage field and Mt.Asamayama in Tsumagoi vill, Gunma, Japan. The village has several camp sites, spa and ski resorts. Palcall Tsumagoi Ski Resort in Tsumagoi, Gunma, Japan. The Lava covered about 6.8 square kilometers of the surrounding forest, forming a flow field 800-2,000m wide and extending 5.5 km to the north. 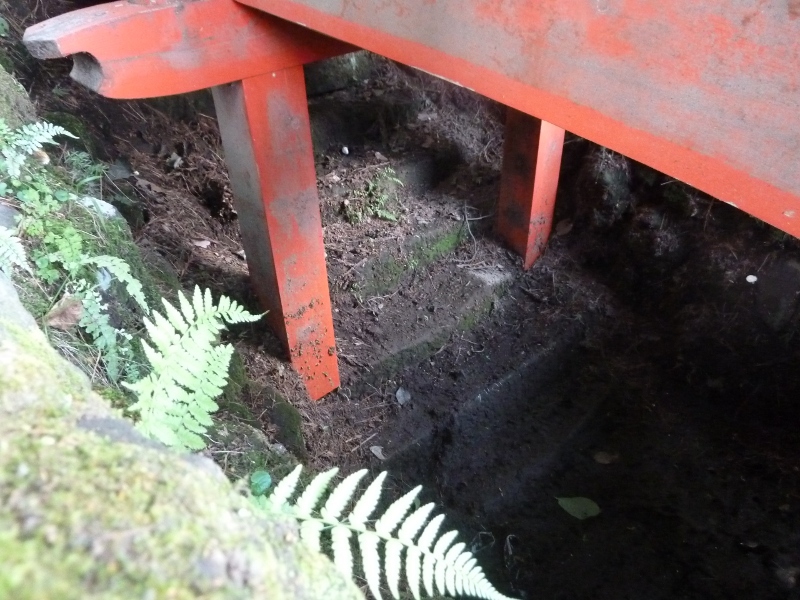 The analyses of the welded pyroclastic rocks show that the Oni Oshidashi lava is considered to be clastogenic lava. Pyroclastic material ejected from a volcanic vent piled up around the vent in the shape of a cone with a central crater. A high flux of pyroclast accumulation around the vent led to clastogenic lava flows from the northern lowest rim of the summit crater. "Oni Oshidashi" means "lava that an ogre pushed outward from a volcano." Visitors can see the Oni Oshidashi lava at the Onioshidashi-en(鬼押出し園, Onioshidashi Park) or the Naganohara town municipal Asama-en(浅間園, Asama Park). The Onioshidashi Park is located near Karuizawa. The Kokudo Corporation developed Onioshidashi as a tourist site. Now Prince Hotels manages the park. In the park Kannon-do(a branch temple of Kan'ei-ji Temple in Ueno, Tokyo) was built to mourn for the victims in 1958. The survivors of the volcanic eruption sought rescue from the Kan'ei-ji Temple. The chief priest of the Zenko-ji Temple in Nagano Prefecture(the former chief priest of the Kan'ei-ji) came to the disaster area, provided meals to the survivors, and chanted a prayer for the victims for 30 days. In the following year, 1784, the priest held a memorial service for the victims at the Zenko-ji Temple. The Great Tenmei famine is considered to have set in 1782, and lasted until 1788. The 1723 Asama eruption contributed to the famine. Volcanic ash was sent down around Japan, resulting in cold weather that led to catastrophic crop failure. Mount Iwaki in Aomori Prefecture also erupted in 1783. In Iceland, the Laki volcanic fissure erupted over an eight-month period between June 1783 and February 1784. The Laki eruption and its aftermath affected the whole of the northern hemisphere.